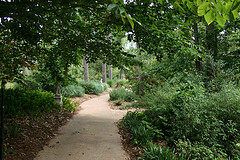 This beautiful botanical garden is located at the entrance to Bailey Bluff and Cypress Bend Golf Resort. 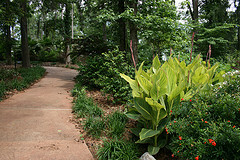 Visitors will find a respite where they may stroll and enjoy the garden or sit quietly and watch the multitudes of butterflies visiting the flowers. 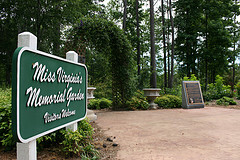 Miss Virginia's Memorial Garden was developed by Bailey Sabine Development - Doctor Bailey - along with the latter part of Bailey Bluff condominiums, which is adjoining, in memory of his wife. 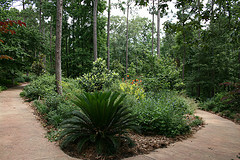 Later, the gardens were given to the people of the area, and our visitors, by deeding the property over to the Sabine River Authority of Louisiana. This small and beautiful park was professionally built and landscaped and maintained for its first few years through Bailey Sabine Development by Cathy McCurdy Landscape Design. Masses of butterflies gather around the flowers at times as well as hummingbirds.